A critical issue headed into 2016 is whether the "one and one" theme continues among market leadership. Specifically, while the FANG Gang, meaning FB AMZN GOOGL NFLX, have held up well after steep uptrend, other leaders are falling by the wayside one by one. We know CMG has been in the news, but regardless of how you interpret it the chart was already ominous and is now in a downtrend. Once-mighty is cheered on each time it flips, but has accomplished exactly nothing since February 2014, struggling at its 200-day moving average. PCLN also gapped down after its last earning and is struggling. AAPL is, essentially, a broken chart below a declining 200-day moving average and a potentially massive topping pattern spanning the last year or so. But Under Armour may be the poster child for the one by one theme, as the growth stock had a terrific summer in light of the Jordan Spieth and Steph Curry success. However, as we have seen with Disney to a degree, the market is a discounting mechanism and may have already priced in the obvious good news into UA. Inside Market Chess Subscription Services, we had shorted UA several times in recent weeks and months under the theory of a confirmed major, multi-year topping head and shoulders pattern. 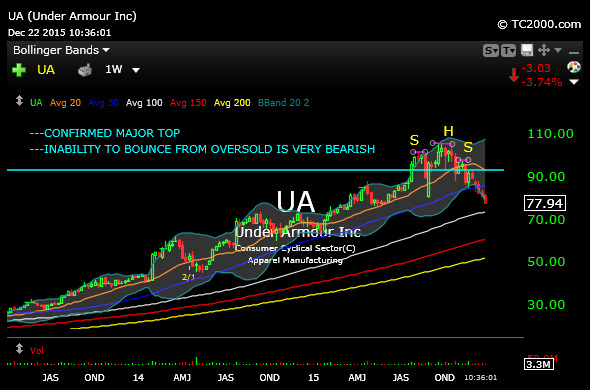 Moreover, the inability of UA to stage so much as a modest, oversold bounce for more than a few hours in recent weeks is likely another ominous sign headed into 2016. Overall, the main issue is whether FANG will eventually succumb to the other leaders which have cracked, on top of all of the long-standing bifurcations across several markets.